Inaugural session of a six-week vocational training for the working children in hazardous job was organized on 29th November at Br. Flavian Technical School Chittagong, CARITAS where 37 children have joined in two batches. 19 children are participating in the trade of Electrical and House Wearing and 18 other children joined in the trade of Motor cycle repair and maintenance. 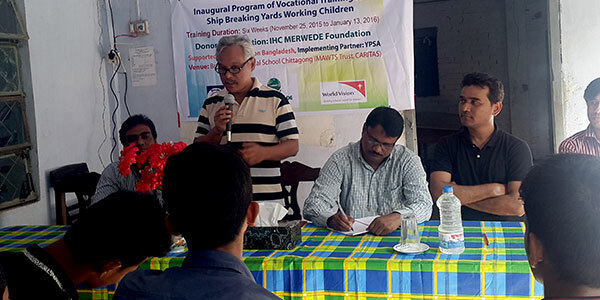 The vocational training is under the project titled as Securing Better Future for the Working Children in Ship Breaking Yard, which is funded by IHC MERWEDE Foundation and World Vision Bangladesh (WVB) and implemented by YPSA. Dr. Samuel P. Sangma, ADP Manager, CTG ADP and District Development Program Point Person of Chittagong district, WVB, were present as the chief guest in the opening session of this VT along with Mr. Robert Kamal Sarkar (PM, WVB), Mr. Shakhar Bain (Finance manager, WVB), Mr. Robiul Karim (Monitoring Officer, WVB), Muhammed Ali Shahin (PC, YPSA), Mr. Azad Abul Kalam (Caritas).